Olympic fever has hit Britain, but it seems that it’s not just people that are going sport crazy…chickens are at it too! The hentertaining website ‘Clickcluck’ has reported on the secret world of the ‘Olympecks HentyTwelve’, and we wanted to share it with you. Now, this article is a real giggle, and you will want to sit down with a cuppa to read it. The story features sports you never knew eggsisted, such as the Synchronised Dust Bathing, Ladies’ Nest Boxing and Mud Diving Event. And, just like the London Olympics, there have been a few hiccups along the way, including GB’s Cream Legbar Lily testing positive for Poultry Spice. Tut tut! But after all the eggcitement and difficulties, how did Team BritHen do? You’ll have to read the story to find out! Now for more on the Hungry Bin…this month Kitchen Garden magazine are running a competition to a win a Hungry Bin Super Starter Pack. There are also runner-up prizes of a Kneelo Ultra Cushion Kneeler and a Gardening Set for Kids up for grabs, and it couldn’t be easier to enter. Simply visit the website and fill in the online form! Competition closes on Friday 7th September. Meanwhile, Compost Woman still has her Hungry Bin on trial and she’s very impressed with the results so far. She has been adding a couple of inches of food and garden waste every day, and after three weeks she reports that there is still no smell, despite the warm weather. She has been using the ‘worm tea’ and she says that her plants love it! Not long until she should be harvesting her first compost now, and you can keep up to date with her progress by reading her blog. Times are hard and interest rates are low, so you may be considering investing your money in something a little bit different right now… So, what about chickens? 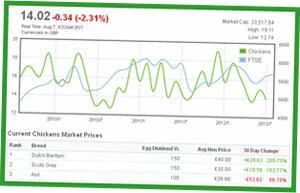 We have just introduced our first Chickens Stock Tracker to help you make the right henvestment! One of the biggest online markplaces for chickens, we have now leveraged our eggstensive database of breed prices to give you up to the minute data. See which hens have gone up in price, which have gone down, and which maintain their value, so that you can always choose the right breed for you. So what’s the latest on the Chicken Stock Market? Dutch Bantams have gone up by 285.75% in 30 days, Ex-Batts have remained steady, and Friesians are down 82.53%. A good time to add a few Friesians to your coop perhaps! ?